At the first church I served, there was a service in the evening on Maundy Thursday that began with communion and ended with Tenebrae. They did not have a custom of worship on Good Friday. What they did have was a rough and rustic cross that took the place of the brass one during Lent. I was over-eager, and glad to be serving this church, and possibly at my most pious ever, and I felt like I ought to do something. I planned a service for noon. I chose poetry and scripture. I copied and pasted three Taize chants into a bulletin. I created an, I hoped, evocative arrangement on the altar. I arranged chairs in the chancel, where we could sit at the foot of the cross. Then I waited to see if anyone would come. The nursery school had been in session that morning, and four of the teachers came to join me, church members all. Another woman arrived just as we were sitting down. Three women are named by Mark, along with many other women. It wasn’t supposed to be a service just for the ladies, but somehow it felt appropriate. There we sat: Martha, Joanna, Ginny, Jan, Marcia, and Liz. I don’t know if they were there for me, or for Jesus, but I was glad for the company as I tried to bear witness. Our six chairs formed a horseshoe open to the cross. It must have been the same for the women, named and unnamed, clustered together. There must have been some comfort in being together even as they witnessed his horrifying death. They had each other as a shield against the jeers of the crowd, as a reminder that his love was real and could not be killed despite the worst the world could do. We’re living in a Good Friday world. We need to hold onto each other. 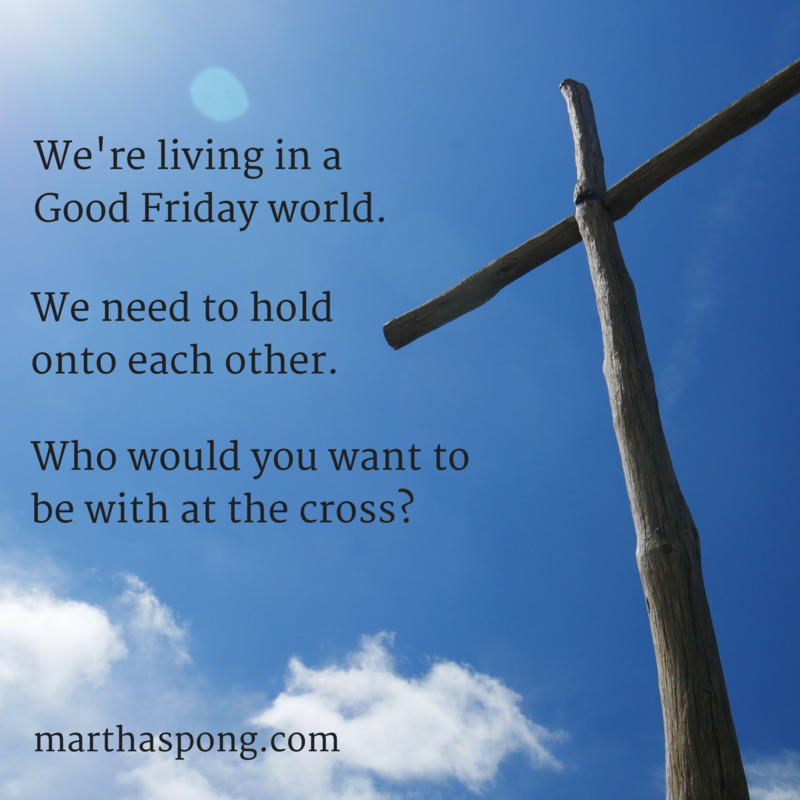 Who would you want to be with at the cross? Thank you, God, for the people who bear witness with me as I strive to stand for you.